Tell us what you think of Skin Salve on the contact us tab! I received a free sample at the Vegan weekend in Snowdon and it has helped reduce my rosacea. 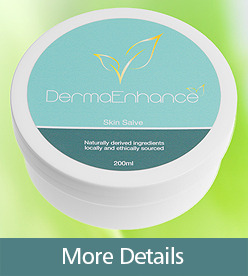 Over the last few months I have tried a range of products since going vegan and yours seems to be the kindest to my skin so thank you for all your hard work in developing DermaEnhance. Denise, Birmingham. The moisturiser is rich and absorbs easily into your skin. I find that I can use the moisturiser on my face as well as my body. Lorraine, Chesterfield.